Dog Urine Removal - Do-It-Yourself Tips - Because Accidents Do Happen! Tips When Rover Misses His Mark! Dog urine removal is a problem almost every dog owner will encounter sooner or later. Recently, I noticed some old stains starting to reappear again on my carpet. Why do I say again? Well you probably know that dog urine stains usually don't get gone forever unless you are able to catch your dog in the act and tackle them right away. But, if you're not so quick, a couple of months after cleaning up the rugs, they're back...aargh! I'd have to say, in defense of my dog, that these accidents started to occur when she became diabetic and was less in control of her bladder. Unfortunately, they were not spotted right away. So now, they are pretty much there to stay and after many cleanings, a change of flooring is in the cards. So What Floor Surface Is Best? In talking to the flooring experts, you will find out that any surface can be damaged by dog urine if it is not cleaned up almost immediately. Sound disheartening? Yes and no. If you're a pet owner, you've probably already resigned yourself to the inevitable accident because you love your dog and think his companionship outweighs the minor inconveniences. On the other hand, forewarned is forearmed! If you're prepared for doggie accidents, your home can survive floor damage from dog urine no matter what floor surfaces you choose to have in your home. Here are some DIY approaches to keep in mind for future puddles. A wet/dry vacuum to rinse and extract moisture quickly. This "not to be without" tool is worth its weight in gold and will serve you well for many other purposes around the house. It's amazing! OK, now you're ready to launch your attack. Place a thick layer of paper towels topped with a bath towel over the urine and blot up as much as you can, changing towels as necessary. Have the heaviest person around stomp on the towel for best results! 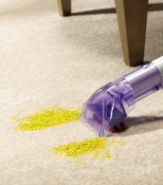 Load up the wet/dry vacuum with plain water and rinse/extract the area several times to complete the urine removal. Extract as much moisture as possible before going to next step. Mix up a solution of plain water and ammonia (7 to 1 ratio) and spray over the area. After a few minutes, blot up with clean towels. This is to remove any staining. Mix up a "separate" solution of plain water and white vinegar (7 to 1 ratio) and spray over the area to neutralize the ammonia. After a few minutes, blot up as before. Repeat the last two steps one more time, then dry thoroughly. This process should have good results on a new carpet. Should any residual stain or odor remain, or if you are dealing with older damage, I have recommended an enzymatic cleaner and an odor neutralizer on this page. In my own experience, I purchased some dog urine removal products from my carpet installer, which worked well with the process described above. Removing the odor is very important to make sure your dog cannot detect it and return to the scene of the crime! If you have other surfaces, such as wood, laminate or sheet vinyl on your floors, cleaning up quickly with paper towels is the first step. Then wash with soapy water, rinse, and follow up by applying an enzymatic cleaner to the soiled area. If you are dealing with old stains on wood floors, you may have to remove the varnish and refinish the area. The following technique has been reported by many as an effective way to do this. Apply hydrogen peroxide to the stain and let sit for a few minutes, then scrape off the finish from the stained area. Repeat the application a second time with the hydrogen peroxide, only this time cover with clear plastic and let it penetrate for 2-3 hours or even much longer. If necessary, you may have to repeat this step again on a really bad stain. When you have attained a satisfactory result, refinish the wood surface in the normal way and make sure you have it is well sealed. Health Related Dog Urine Accidents? If your dog's accident is an out-of-the-ordinary event, not just part of the housetraining process, he might be having a health problem. Keep an eye on him for a few days to pick up on any changes, especially in regard to eating and drinking. After one of my dogs had her first accident, I noticed that she was a lot more thirsty than usual. In fact, I caught her trying to get through the fence to a neighbor's fountain after she had drained her own water bowl. I quickly took her to the vet and learned that she had diabetes. On the other hand if your dog's accidents become frequent events, you may have to go through another period of housetraining. Try marking a specific spot in your yard with the cleanup cloth from the accident. Then take him there on a leash for a couple of weeks until he starts to recognize the area and its purpose. And don't forget to praise him when he gets the job done. May you and your dog find this article helpful to your relationship!